CEO/CFO quarterly updates, articles, stories and business news from the most renown business information sources. Click to learn more. C-SuiteGlobal.com offers coaching services to executives. Click to learn more. The number one place for CEOs, CFOs and other C-suite to network with peers and more. Find a new job, find new executives, look for new partners or investors, buy or sell companies. Visit our Ads Board for business opportunities. How can we help? Whether it's for a business loan, line of credit, mortgage or for a new bank account, visit us. Welcome to C-SuiteGlobal.com – an exclusive group of social and business networking designed for executives. It began seven years ago with coaching CFOs who were looking for a new career. After a number of changes, still helping executives, C-SuiteGlobal now offers round table events for senior executives on subjects of current interest. C-suite mission: the focus is on networking, coaching and informing. C-suite business model: its purpose is to provide free services. Revenues will come from sponsors and from advertising to help cover the hard costs and some of the hours given over to building and running the organization. Our pledge: "To offer a superior venue for the C-suite to be informed, coached and provided with a means to network with peers." Our Goal: to be one of the best executive groups offering superior services. From left to right: Andre Couillard CEO of Procom Quebec, Marc Chabot, Fondateur CEO/CFOCanada.ca, Robert Delandes CFO of Intema Solutions. 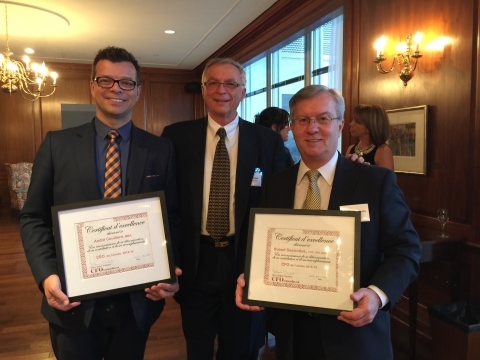 - Andre Couillard CEO Procom Quebec, "CEO of the Year"
- Robert Delandes CFO Intema Solutions, "CFO of the Year"
A certificate of recognition was presented in each category at the annual cocktail event this April 22, 2015. CEO and CFO of the year for 2014-2015 were honored for their outstanding contributions to the community and their organizations. Click HERE to invite a friend. Copyright © 2019 C-SuiteGlobal.com. All Rights Reserved.